LEN - www.lankaenews.com | Maithri- Mahinda Peacock dance recital; inside story -whither SL? 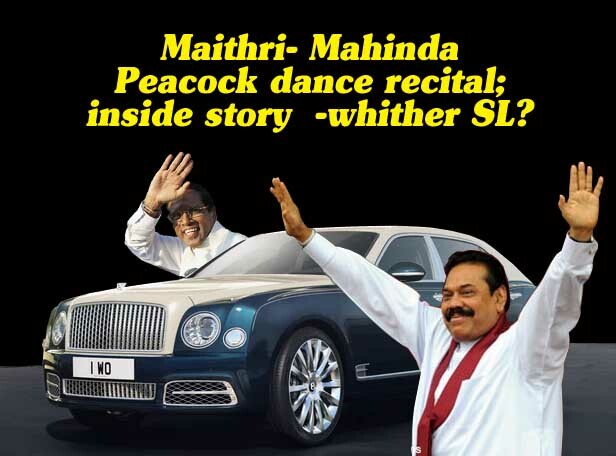 Maithri- Mahinda Peacock dance recital; inside story -whither SL? (Lanka-e-News - 08.March.2018, 11.45AM) The super luxury car – Bentley Mulsanne Hallmark bought for Rs. 1.6 million by Sri Lanka’s multimillionaire businessman Dhammika Perera entered the gates of a Paget Road residence , one night last week . Guess who came out to enter the car with two security personnel ? It was none other than Maithripala Sirisena , the president whose popularity has by now dropped to a most despicable 4 % , but still holds the post of ‘honorable’ president of Sri Lanka . What happened thereafter is even more shocking ! This car with Sirisena went straight and stopped at a house in Flower Road ,Kollupitiya belonging to Dhammika. The other individual in the Kollupitiya house anticipating Sirisena was another faceless , ruthless Machiavellian - ex president Mahinda Rajapakse. The secret discussion that took place between the ex president and Sirisena is no secret now to the country. Based on information seeping out , following the recent local government polls , the rift between Gotabaya and Basil has deepened .Sirisena however has used this rift to help Gota realize his dream . Hence, in that context the Sirisena – Mahinda discussion was most decisive. Under the 19 th amendment ,Mahinda cannot again contest as presidential candidate. Yet under the constitution it is the presidential elections that should be held first. It is why Sirisena who is having secret exchanges with Mahinda , inquired from the Supreme court whether his term can be prolonged to six years . The cabinet reshuffle in respect of the UNP alone without his party’s is also part of that conspiracy. Roshan Ranasinghe leaving the Mahinda team was an outcome of the rift. It was the justifiable contention of Basil , if Gota is to be the presidential candidate , the Tamil and Muslim votes as well as those of Colombo and the Urban middle class cannot be secured, and he would definitely lose . To illustrate his point , Basil said , because Roshan made a big din in the entire Polonnaruwa district that Gota is the next presidential candidate prior to the local government elections ,the Flower Bud could not secure the votes of the Muslims .Basil has proved that with evidence. At the same time Basil -Mahinda’s team had charged that Gotabaya during the local body polls the latter stayed put in America. It was also pointed out it was Basil who shouldered the entire election campaign , and that Namal gave the consent and support to it..
Gota was only issuing notifications from America , and after his return , the media cronies of Wimal inquired about Gota’s presidential candidacy, Basil accused. The website of Wimal giving publicity that the American citizenship of Gota is going to be cancelled , also came in for heavy flak from Basil. It is following these frictions , the attempts to arrest Gota were initiated prior to the local body elections. Basil’s wealth and political connections have contributed to that. Sirisena who learnt of this had immediately dispatched Gota to America for which Sirisena received Mahinda’s blessings. Between Sirisena and Basil is a deep rooted grudge .Basil treats Sirisena as a ‘double- crosser and enemy who destroyed the future of Rajapakses. Hence Basil takes the steadfast stance that there cannot be any dealings or friendship with this double faced Sirisena .It is the truth that the Flower Bud won without having any ties with Sirisena. During the Rajapakse era , there were attempts to push out minister Sirisena from SLFP general secretary post and take that to Basil’s hands . If Sirisena seeks to organize a protest or calamitous situation within the party against that , ‘Sirisena will be made to wear the jumper suit’ , Basil had boasted earlier on. Basil has evidence to ‘fix’ him perhaps. Many have even reminded to then minister Sirisena , if he is to lose at the last presidential elections , and he was to wear the jumper suit like Sarath Fonseka had to, what amount of support Fonseka received locally and internationally. In the end ,Sirisena agreed to be the common candidate axing Nimal Siripala De Silva because of the conflict between himself and Basil. Owing to this ,it was Basil who became the accused when charges were mounted that he was responsible for chasing Sirisena out from the party , as well as the defeat at the last presidential elections. Though Gota was the one most blamed following the defeat , yet it was Basil who had to leave the country immediately owing to this , while Gota stayed back. The Basil- Sirisena enmity has such a long history . At all events , it is Mahinda who had to bear the brunt of all these issues . This is why Mahinda’s lackeys and lickspittles ,Vasudeva and TissaVitharane are gone underground these days. At a recent discussion among them, Vasudeva the bearded buffoon who has outlived his utility on earh had said , ‘somehow this government must be ousted , and Mahinda must be made president. It is only then we can wear red shirts without fighting shy and mount the stage.’ In the circumstances , until the final decision is heard from Mahinda about the presidential candidacy , Vasu and Vitharane have agreed that they pool all their strength to promote a general election , instead of getting involved in a presidential election. It is well known until the last moment , president Sirisena tried his utmost to jointly contest the local body elections with Mahinda.That was because of the Intelligence division report predicting Sirisena’s humiliating defeat. Basil too had long before ,based on his calculations predicted correctly the victory of Flower Bud. All Sirisena’s efforts went down the drain because of Basil’s calculation and prediction. The pro Mahinda groups with president pressurized the latter irrespective of the past fiascos , to display his readiness again to join after the local elections. The president who was bragging that he had to do a lot of roaming in parliament to get the 19 th amendment passed , did a U turn and inquired about his period of tenure of office from the Supreme Court in order to confirm that readiness. If that effort was fruitful , it was agreed to hold the general elections prior to the presidential elections , and make Mahinda the P.M. while devolving the executive powers to the parliament. Yet because he lost ,Sirisena is urging the Rajapakses repeatedly to give room to make Gota the presidential candidate. The maximum attacks launched on the UNP during the local body elections ,and arrests made based on the Bond scam just before the elections were part of the aim and agenda jointly with the Rajapakses . Yet , to their consternation nothing worked according to plan for them . Though President Sirisena failed in all these efforts , he did not abandon his sly maneuvers . Next he tried to send out the P.M. which also went awry. As a last resort he then insisted on a cabinet reshuffle only in relation to the UNP .President Sirisena had told the Rajapakse camp ,if Mahinda is not agreeing to discuss he will be granting the law and order portfolio to Fonseka. Therefore if they do not come to an agreement , all the Rajapakse family members , as well as the pro Mahinda groups will have to wear the ‘jumper suits’, and if they wish to know about how probable that is , they can inquire from the Attorney General (AG) , the president had informed. The Rajapakses who got panic stricken had then decided to meet with Sirisena. The meeting between Maithri and Mahinda recently at Dhammika Perera’s house is a sequel to this. Maithri had explained the details to Mahinda , and the latter had asked for time to convey his final decision. The injunction order precluding the arrest of Gota being extended , and the law and order ministry still remaining parked in the vicinity of Galle milepost is because of this development. Who will take oaths as minister of law and order , and whether justice will be done to the 2015-01-08 pledges ? Answers to these questions will emerge after the decision to be taken by the Rajapakses today. Strangely , it is Athureilya Rathane Thera who separated from the Rajapakses, who is most energetically and enthusiastically mediating to reconcile Maithri and Mahinda. President Sirisena conducting a campaign to chase out Ranil , and also subjecting him to humiliation and degradation is another Peacock dance of his to please and ingratiate himself into the favor of Rajapakses. Thanks to Sirisena , the pro Mahinda Rajapakse groups have found their much longed for climate to create unrest and turmoil in the country . In all probability it is the Gota sidekicks and scoundrels who are behind the violence and mayhem. Of course Basil is against this. It is Basil’s view , friendly ties with India shall be built even if Europe is left alone , and a free society and environment at least to some extent within SL shall come into being. At this juncture , the sole and whole aim of Sirisena is , after his term is over to escape from the punishment of Rajapakses , go to ‘ Awake Polonnaruwa’ and spend the twilight of his life . In the process he is prepared to betray at any moment anybody who came out of the SLFP with him, and dishonor all the promises he made on 2015-01-08 . The disillusionment and disappointment of President following his popularity dropping steeply to a 4 % at the local body elections , had intensified his vindictiveness and anger.